As you all know, I am obsessed with skincare. While I maintain a pretty strong skincare routine, I struggled to find the right serum to target the melasma and dark spots I have on the upper cheeks and sides of my face (where the sun hits me the most). It has honestly been years of searching to find the ideal serum to minimize my dark spots and even out my overall skin tone. 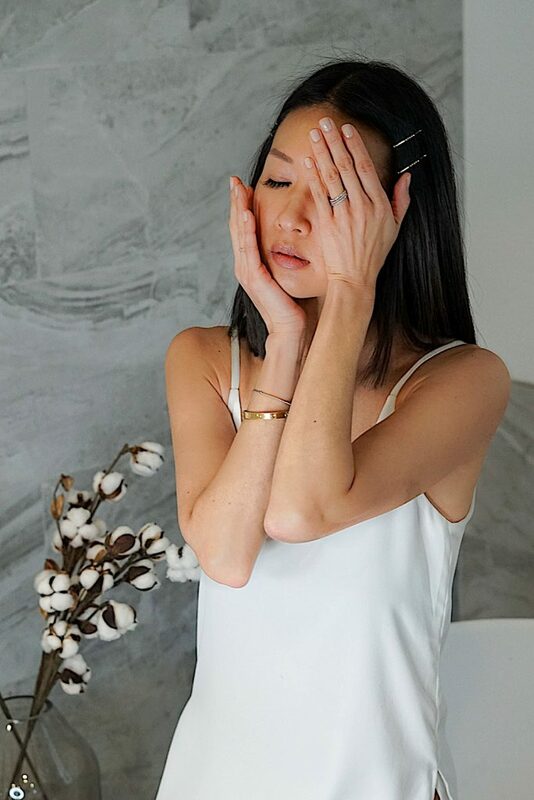 After hearing rave reviews about Clarins’ skincare products, I decided to take their online skincare quiz to see which serum was the best match for my needs. 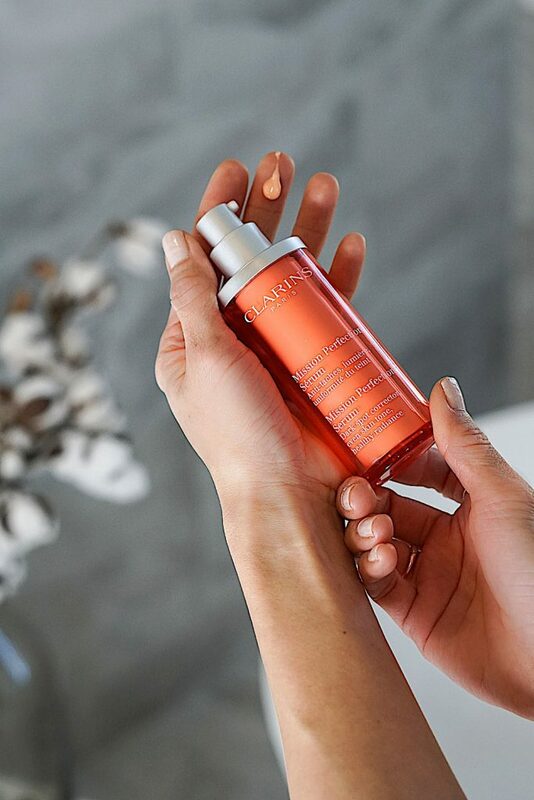 Since my biggest concerns are sunspots and dark shadows, the quiz results showed that the Mission Perfection Serum was the answer to target those stubborn spots. 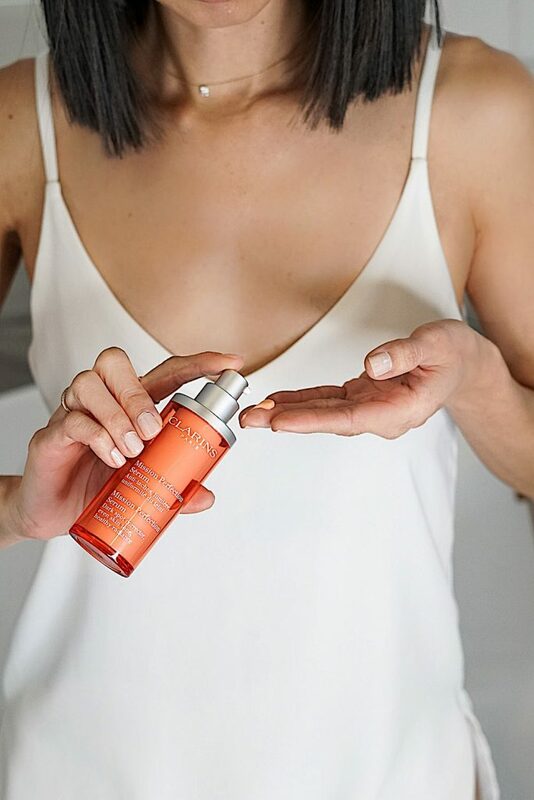 Powered by powerful ingredients of Acerola extract, a wild cherry extract rich in Vitamin C, Gingko Biloba which boosts microcirculation for complexion, and tamarind fruit acids to gently exfoliate dead skin cells, this serum has all the ingredients to treat spots and promote an even, radiant complexion. After I wash my face with cleanser and apply toner, I apply the serum (morning and night). I squeeze the serum into fingertips (you can also use palms) then gently warm the serum between my fingertips. Using light pressing motions from the center of my face outward, I “push” the serum into my skin (this method is more effective than rubbing it into your skin). I follow up with moisturizer in the evening and in the daytime use moisturizer then sunscreen with SPF 50. So the big question is does this serum work? Like any skincare product, you should use the serum consistently for a month to determine results. I’ve been using Mission Perfection Serum for over a month now and I can truly see a difference in my skin tone. My natural complexion is more even and dare I say radiant and glowing, and my melasma and sunspots are definitely minimized. So far I really love the results after using Mission Perfection Serum and will continue to use to improve my skin even more. It is hydrating on my skin, has a light, pleasant fragrance that’s not overpowering, and absorbs quickly into my skin. If you haven’t used a serum before, I highly recommend using one that specifically targets your concerns. Serums are essential because the revitalize from the inside out and in my case, I needed a serum to treat my dark spots and discolorations. If you aren’t sure which serum is right for you, make sure you take this quiz to find out! 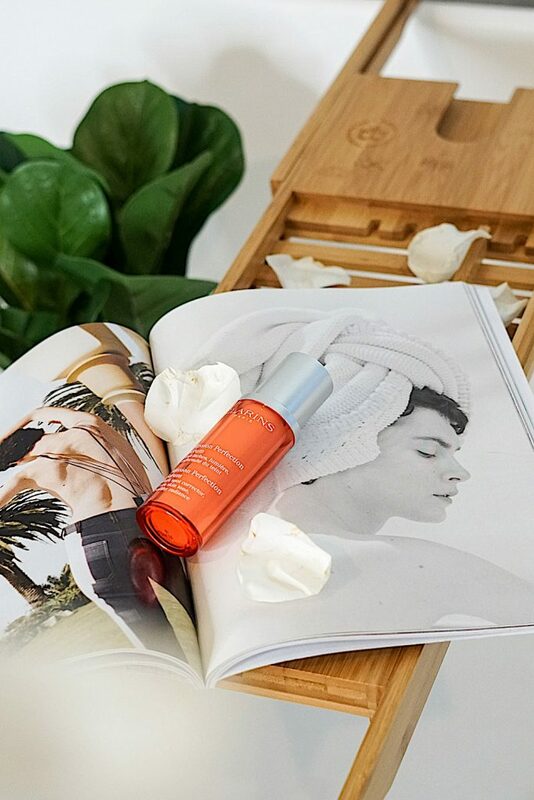 Special thanks to Clarins for partnering on this post, but more importantly truly making a difference in my dark spots. I’ll definitely give this one a try after I use up my current one. I just took their online quiz and got matched up with the Mission Perfection Serum. Thanks for the recommendation. I love clarins! And serum is such a great addition to my skincare routine so thanks for sharing! I’ll check it out because I’m actually running out of the current one I’m using. Clarins is one of my favorite brands ever. They really know what their products need to target. I’ve used it for a long time and its totally worth it. Thanks for sharing! Your skin always looks sooo flawless <3 🙂 Thanks sharing your thoughts about this serum! Need to try it! I love Clarins products!! I used one of their serums before and it was really good!! I’m starting to realize these days that a good serum really makes a difference! I love Clarins products and this sounds like a great serum! Clarins is my favorite brand! How great is that you also like it. I’d really like to try the Mission Perfection Serum. It seems to be really cool for the skin! Ooooohhhh I want to try. I love serums over lotions for sure. I did quiz and got their Double Serum! I love Clarins, it’s such a great brand. This looks like a must try for me. Thanks dear! Sounds amazing! I have to try! I usually love Clarins products. It’s never easy to find the perfect product. OMG I wish I had your amazing skin! Ill have to try this out! I’ve heard so many great things about this serum! Your skin is amazing, thanks for sharing! 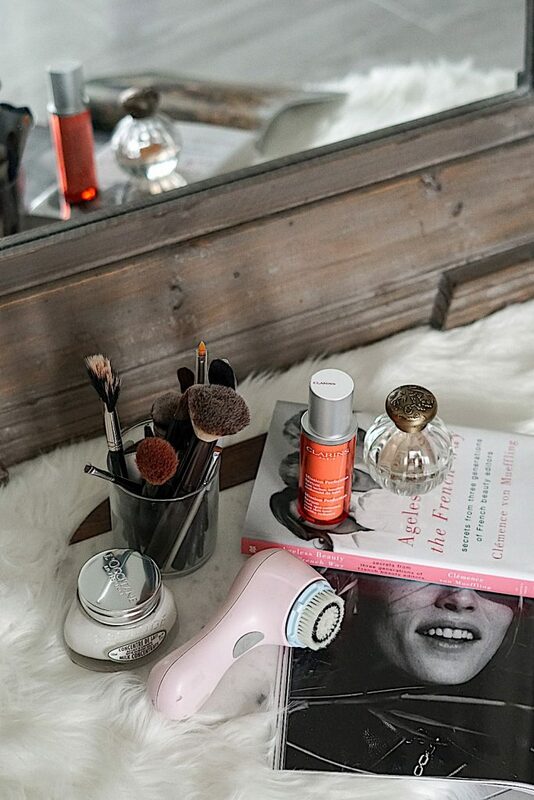 Your skin is absolutely glowing in these photos Christine! I’ve heard so much about that Clarins serum, but I still haven’t had a chance to try it yet! Can’t wait to try it! Beautiful! Love serums that give us our glow back and make our skin look youthful. 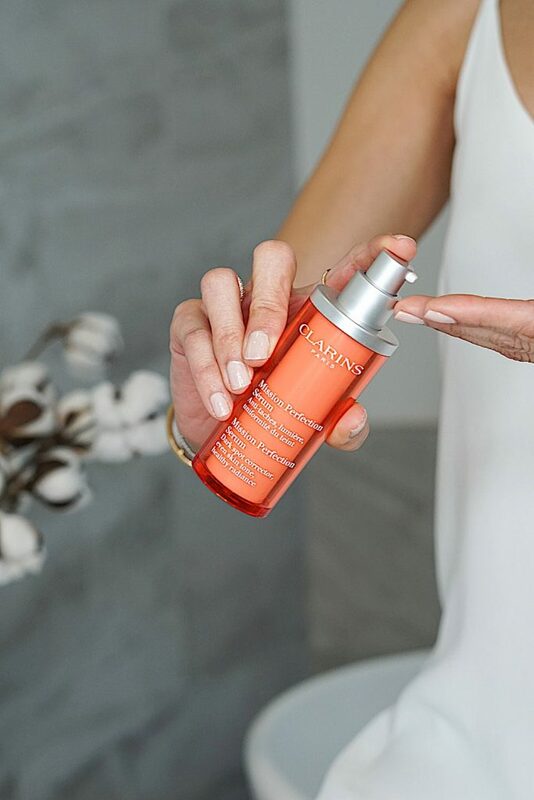 I have been hearing so many great things about Clarins as of late! I really want to try it! I love how they have a serum for each skin type. I just took the test and they recommended Pore Control for me! Thinking of buying it now! Such a great price! Yes yes yes! I love this serum <3 I really does work wonders. Thanks for sharing this babe! I heard such great things about Clarins! Need to try this serum! I also have dark spots and discolorations but I haven´t heard of this serum. Although I´ve tried several Clarins products and used to love them! Thanks for the review!